Villa Niyati is a unique island estate set on a mountain overlooking picturesque Kamala Beach. It has the capacity to accommodate groups of up to 24 people, which means that you can book it for a family reunion, team building trip, or a dream getaway with a large group of friends. 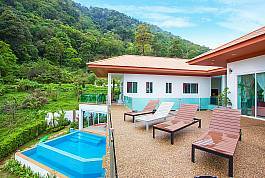 Located just minutes from Phuket's legendary shoreline of Patong Beach, the 16 guests of this monumental 7+ bedroom villa will experience the paradise vacation of a lifetime when staying at this accommodation. Patong Hill Estate hosts incomparable amenities and brings a new meaning to the term luxury holiday home. Organize your extended family or a group of friends and embark on a truly unique Phuket adventure! Conveniently located close to a gorgeous beach and lively tourist areas, yet secluded enough to offer a great deal of privacy, this vibrant 7-bedroom pool villa has everything one might need on a dreamlike holiday. 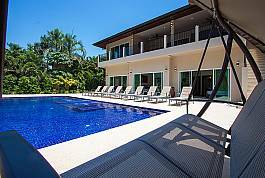 This welcoming villa, set in southern Phuket near one of the most beautiful beaches, is ideal for large parties with children. Spacious, elegant and showing off a number of areas where family and friends can come together, this is the holiday home you and your loved ones will keep returning to.